From the Hurstbourne Parkway area - Turn south on Taylorsville Road heading out of town (Louisville). Taylorsville Road is State Road 155. At the Taylorsville and Hurstbourne Parkway intersection are some fairly prominent landmarks: a car wash, Picadilly Cafeteria, and Shogun restaurant. Proceed south on Taylorsville Road for 2 miles and 5 stoplights. At the 5th stoplight, turn left (east) on Watterson Trail. Look for Quality Exhaust and King Southern Bank. Go east on Watterson Trail for 1/2 mile. Turn left (north) on Bluebird Lane. Take the first driveway on right-hand side into library parking lot. From I-64 take the Blankenbaker South exit - Continue on Blankenbaker through 4 lights. Continue to a stop sign and turn right on Blankenbaker Access. Continue for a short distance and turn right on Ruckriegel Pkwy. Again go a short distance and turn left on Watterson Trail at the traffic light. Go up the hill past the library and turn right on Bluebird Lane. Turn right into the parking lot. From Gene Snyder Parkway - take the Taylorsville Road exit and turn west on Taylorsville Road towards Louisville. Proceed for approximately 4 miles. At the Watterson Trail and Taylorsville Road intersection turn right (north) on Watterson Trail. At this intersection you may see the following businesses: King Southern Bank, and Quality Exhaust. After turning right onto Watterson Trail, go for approximately 1/2 mile and turn left (west) on Bluebird Lane. Take 1st right into parking lot. From the Middletown Library - Turn right on Shelbyville Rd. Turn left on Watterson Trail at Mark's Feed Store. At the stoplight intersection with Blankenbaker turn left. Turn right onto Watterson Trail. After Skyview Park, Watterson Trail turns right and goes uphill past the Library. Turn right on Bluebird Lane and turn right into the first driveway. 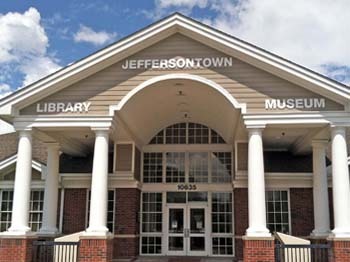 The City of Jeffersontown has had a public library for most of this century. On May 11, 1911, a library, sponsored by the Current Events Club, was started in a "newly papered and painted" room of the Bruce Building on Jeffersontown's historic Town Square. In 1917, the library received books from the Main Library and was moved to the town bank. From 1917 to 1938, it relocated to various locations, including private homes, and was staffed by volunteers. In 1939, the library moved to the Municipal Building and later the WPA Recreation Center, the librarians being paid by the Woman's Club. After relocating to the old Jeffersontown High School, the library was closed for four years. It reopened in 1948 on the back porch of Betty Elswick's home. After a stay at this location, the library moved to an annex of the Presbyterian Church, and in 1962 it moved to the Jeffersontown Shopping Center and became part of the Louisville Free Public Library system. From here, the library relocated in 1970 to Colonial Manor, a former county home for the poor. The library operated in Colonial Manor until 1994, when the branch returned to the shopping center while a new library was constructed. The new branch library was built next to Colonial Manor, and the $1.5 million branch opened on January 29, 1996. The 14,000-square-foot building features a wing devoted to children's and teen's services and materials, an adult reference area with more than twenty computers, a meeting room available for public use, and a comfortable reading area awash with natural light. The Jeffersontown Museum, under separate management, occupies the south side of the structure.